Halifax went agonisingly close to ending Leigh’s unbeaten Championship record in an explosive encounter at the LSV. Karl Harrison’s side eventually lost 26-24 after a late Oliver Wilkes try, converted by Martyn Ridyard, saw Leigh overhaul a 20-24 deficit. But the scoreline tells barely half the story, with Wilkes’ try coming after a terrible error from Fax number one Ryan Fieldhouse, who failed to clear the ball in his own in goal. And even then, the visitors had a gilt-edged chance to win, only for winger Gareth Potts to go for the corner with Fieldhouse apparently unmarked on his inside. Earlier, both sides had been reduced to 12 men with Fax’s Dane Manning and Leigh’s Kurt Haggerty had been sent off after Manning flattened his former teammate Sam Barlow, who was taken to hospital after the game for further treatment. That incident, which came with Leigh leading 20-12, sparked an all-in brawl which seemed to energise Leigh, who spent the next 10 minutes pounding Fax’s line. 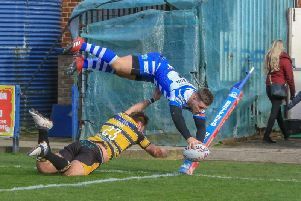 Harrison’s side, without injured skipper Scott Murrell, dug deep though and when they finally got their hands on the ball, courtesy of a tremendous kick, chase and ball steal from recalled half back Simon Brown, they scored twice in quick succession through Luke Ambler and Luke Adamson. Steve Tyrer’s conversions gave them a 24-20 lead, but Fieldhouse’s freakish error let Wilkes in and Potts’ late run came to nothing as the visitors were left to settle for a bonus point. Earlier, the visitors had been caught in an onslaught in the opening minutes, with Leigh unplayable at times. Winger Jonathan Pownall had already been shovelled into touch by Potts once, but the Fax speedster couldn’t get there a second time as Pownall squeezed in at the corner after five minutes. Martyn Ridyard added the conversion and the home side were 12-0 ahead when Ridyard’s 40/20 kick created the position for Barlow to send Wilkes over the line. When Fax finally got some possession, they looked dangerous, with both Manning and the excellent Peter Fox going close. And they cracked their hosts on 17 minutes, Potts finishing exceptionally well from Fieldhouse’s pass and Tyrer adding the extras from the sideline. Leigh’s response was immediate, Barlow and Matt Sarsfield breaking down the middle and Gregg McNally finishing in style. Ridyard made it 18-6, but Fax managed to stem the tide after that and started to turn it when Tyrer rose above the defence to claim Simon Brown’s kick and score just before the break, the centre’s conversion cutting the visitors’ deficit to 18-12. That was only the start of the drama though.